FEBRUARY 2008 -- Last month Higganum Grange held a pot luck supper. The theme was ‘to bring a dish with the dish’. (Or bring a friend with the menu offering. Thanks for the idea, Gail Hanson and Suzanne Giuca.) Then this month was writing down resolutions to improve the Grange. (Again thanks to Gail and Suzanne.) We are always hoping to enlist new members and by making our Grange a nicer place to visit, keep them. Is the Grange important to you? 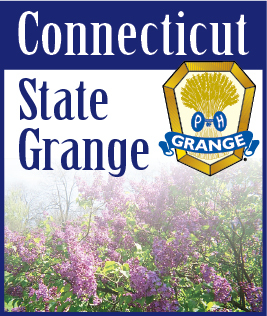 Each person that is a member of any Grange belongs because the Grange has something that is meaningful to the member. Each member feels needed or rewarded with their participation. 1) Identify potential members; Friends, Co-workers, Relatives, High profile people in the community. 2) Make personal contact by ASKING directly for those individuals to come to your meeting. 3) At the meeting ENGAGE the potential member by: Smiling, Searching out the persons interests, and Seeking their feed back of what they think of your Grange. 4) Involve the person in your Grange. Let them know how they could help. Ask them to help (don’t ask if they can) your Grange. 5) Make your Grange have impact in the community. Take a stand on an issue. Do something that makes a difference. No one wants to feel that the organization that they belong to is just a waste of time. 6) Take the time to plan out your meeting. People are comfortable with structure. Have your meeting flow smoothly. Don’t let it get boring. Keep it fun and plan a special program when you know you will have guests. I am still wanting to visit different Granges. I would appreciate a contact from your Grange about requests for me to visit. I am listed in various booklets. All of us are aware that the Grange needs new members. Each individual member should consider themselves honorary members of the membership committee. The challenge is on to identify potential members and implement a plan of action to bring them to your Grange. By following through we will be able to bring membership numbers up. Let’s keep the Grange important to everyone.